Bring water and sausage to a boil in a large skillet. Reduce heat and cover. Simmer for 7-8 minutes. Add milk, seasoning and butter to skillet. Cook and stir until butter is melted. Cool completely. Pour into gallon size Ziploc freezer bag. Add broccoli and peppers into a separate small Ziploc bags. Add Parmesan cheese into a snack size Ziploc bag. Place spaghetti (broken in half) into snack size Ziploc bag. Thaw sausage mixture and cheese bags only. In large pot, cook spaghetti according to package directions, adding frozen broccoli and peppers during the last 4 minutes of cooking time. Remove from heat and drain when pasta is done and veggies are cooked to your liking. While pasta is cooking, heat sausage mixture in microwave or on stove until hot. Drain spaghetti and vegetables. Return to pot. Add sausage mixture and cheese to spaghetti. Toss to coat all noodles. Serve hot. Layer chicken and broccoli in gallon size freezer bag (note, the chicken is raw and the broccoli can still be frozen). In mixing bowl, beat remaining of ingredients (except the pasta). Pour on top of chicken and broccoli. Seal and lay flat to freeze. Thaw completely in fridge. Pour contents of bag in crock-pot. Cover and cook on HIGH for 2-3 hours or low for 4-5 hours. Cook pasta according to directions on box. Serve chicken mixture over hot pasta. Enjoy! This is my version from the Pampered Chef "Great Grilling Recipes" Cookbook. 1. Remove skin from raw chicken. 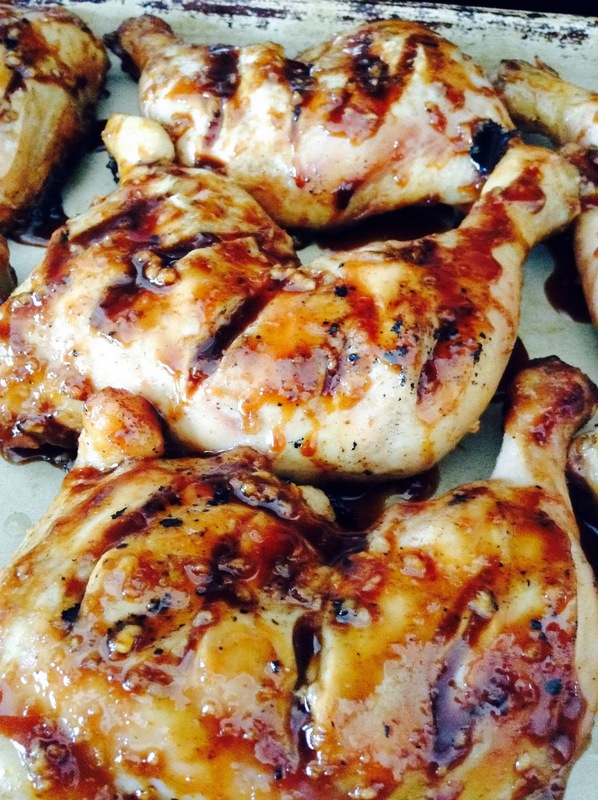 Make 3/4" slits in the chicken thighs and drumsticks to allow marinate to penetrate into the meat. Place chicken in gallon size Ziploc bag. 2. Peel ginger root and grate it enough to make 2 1/2 Tablespoons. Combine ginger, hoisin sauce, Soy sauce, Vinegar, brown sugar and garlic powder in bowl. Mix and pour half of sauce into a sandwich bag to save when grilling. Pour the remaining sauce in bag of chicken. Freeze in freezer. 1. Thaw completely and cook on grill, covered with foil, over med-high heat, 25-30 minutes. 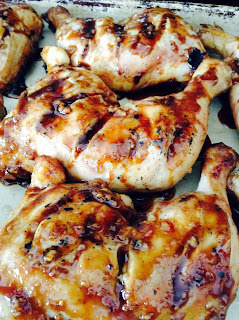 Turn frequently and baste occasionally with reserved marinade.